Great! If someone teaches me to knit (my Mum has tried several times, I warn you), and someone teaches me to make a gin&tonic sorbet, I can teach you... how to belly dance. This would be so much fun! Specially, if we do it after the gin&tonic sorbet! We could all teach other something! Or does that sound a bit like a scout camp, rather than a blog camp? I must warn you. I once went to Zumba class, part of which entailed belly dancing, and it wasn't pretty. Can teach everyone to swear in Finnish (which is all the lingo you'll ever need should you ever venture into Finland) and that's pretty much it. Don't really have that many talents... unless you count drinking anyone under the table (coffee or wine), but that is more of a liver issue and less of a talent. Hmmm. Will get back to you on that. now THAT is awesome. i've always thought belly dancers were amazing. its like being hypnotized. but not with the little wierd swirly thing or with a swaying watch. its with the hipps. totally awesome. 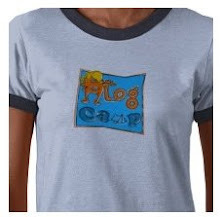 Hey Blog camp...I've tagged you for an award because I am insanely jealous of your camp and on day hope to attend! this is so exciting. i've got some blog camp goodies brewing as well. more on that soon! Extranjera - I accept your drinking under the table challenge although I acknowledge that it might not strictly be classified as a talent. Oh and I can teach you all to swear in German. gin & tonic sorbet—here I come!